Blokus World Tour Game Review - Download and Play Free Version! 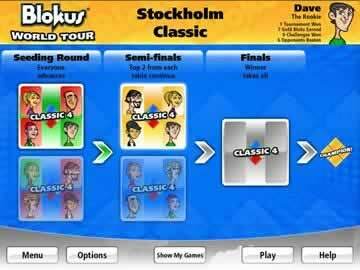 Become the King of the Classic Board Game Blokus in the Virtual Remake Blokus World Tour! Great PC version of the classic Blokus board game. 5 difficulty settings make it so all users can play. Challenges pose different scenarios that are fun and thought provoking. Gold trophy blocks awarded for complete challenging tasks. Unable to play others in an online play. Graphics and audio qualities could use improvement. Relive The Classic Board Game! 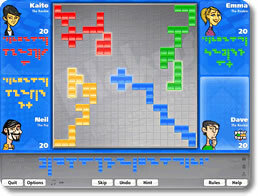 The best-selling board game Blokus comes to the computer for the first time with multiple game modes, colorful graphics, and lots of personality. Experience hours of fun with this turn-based strategy game that will have you traveling around the globe on the quest to become the Blokus world champion. Compete in 10 tournaments as you make your way through the world tour and face off against 16 different computer players, each with their own play styles and specialties. You can also compete in quick games against the computer or with some friends. For those of you who have never played a game of Blokus before, the rules are quite simple with up to four players start with 21 "polyominoes", which are Tetris-like shapes consisting of up to five linked squares. When it is your turn, you pick a shape and place it somewhere on the board with the final objective being to fill up more spots on the board than your competitors. The only twist is that the shapes you place on the board must touch another one of your pieces by one or more corners, but no edges can touch. Blokus World Tour provides an excellent avenue for fans of the game to experience multiple game modes and practice their Blokus skills. With a clever hint system and various difficulty levels, new players can quickly grasp the game mechanics and veteran players can face a real challenge. If the world tour isn't enough for you, there plenty of challenges and golden blocks to collect. Although the game has no on-line multiplayer, there is the option to play a Classic game or a Duo game with up to four players on the same computer. If you are any fan of the board game, then download Blokus World Tour and let the fun begin! For those of you unfamiliar with the board game, Blokus is a Tetris-like grid game that has you placing various shaped and sized pieces on a 20x20 board. This game was developed by a French mathematician in 2000 and has since been voted one of the best games of the decade by reviewers and even Mensa. This block board game is fun, educational and the PC version retains its basic elements while expanding upon them in some surprisingly fun ways. This game is perfect for any fan of the board game or for anyone looking for a new and highly ranked thought provoking challenge. In Blokus World Tour you will get to enjoy the classic game Blokus in several forms, against varying opponents, and through different scenarios. In this game 4 players play and take turns laying down blocked shapes on a 400 space grid. Players alternate turns and the object of the game is to lay down as many tiles as you can before you are unable to make a move. The tiles vary in size and shape, with the biggest being different variations of five connected blocks. Placing the tiles can be the trickiest part of this game. Because your pieces can only touch corner to corner, you must carefully place them on the board, making sure you secure yourself enough game board real estate for later moves, while simultaneously getting rid of as many pieces as you can. There are 21 pieces in all and a 20 point bonus is awarded for placing your smallest single block piece last. The multiple game modes, computer players, and five difficulties make this game uniquely great from its board game predecessor. In this game, unlike the board game, you can play by yourself against different computer opponents, varying in difficulty. Because you don't have to rely on other people to join you, this game becomes a lot more fun and accessible. Also, the five difficulties and three game modes (scenario and challenges) add to the playability and make this a game for all ages and experience levels. The scenario modes are great and add to the dynamics of the game. 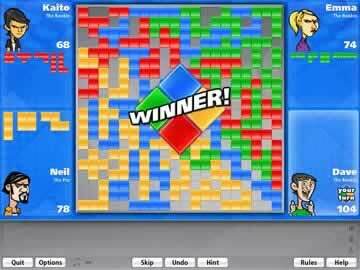 Through this mode you will be faced with challenges like scoring more points than your opponents while starting behind, or using all the red blocks in a game where you have control of all the other colors (surprisingly difficult). The challenges are great for breaking up the potential monotony, while adding a tasking and exciting element to the game. Block World Tour gets its name from the travel based tournaments you will play in the Classic game mode. The tournaments take place in different countries on different continents and increase in difficulty and size as you advance. These tournaments are ways to earn the coveted “golden” blocks, which are awarded for small successes throughout the game. Traveling around the globe is a fun element of this PC game, however, travel to play others from different countries would improve the game and make the name more pertinent. Online capabilities would make this world tour game an actual world tour which would be really exciting and competitive. Apart from not having online capabilities and the few graphical and audio errors this game possesses, Blokus World Tour is a really engaging and well produced game. Again, this is perfect for all ages, especially those familiar with the board game version or looking for a challenging puzzle styled game. Being able to play alone and in different scenario challenges makes this game much more accessible and fun to play. Blokus World Tour comes highly recommended and is worth your time to download and play.